Based on the Song of Fire and Ice fantasy book series by George R.R. Martin, the first season of HBO’s Game of Thrones introduces four great family Houses in the alternate world kingdom of Westeros – the Starks, the Lannisters, the Baratheons, and the Targaryens. Each of them is vying for control of Westeros, for control of the Iron Throne, with political intrigue and betrayal a-plenty. The thing to keep in mind here is that, even if you don’t like fantasy, what makes this show great is its character drama. The heroes are deeply flawed. Most of the villains have a redeeming quality or two, or at least the odd empathetic moment. This is very much an ensemble cast and every single one of these characters feels dimensional and complex, with unique quirks and foibles, and they only grow more so as the series unfolds. The company includes Sean Bean (The Lord of the Rings), Mark Addy (The Full Monty), Lena Headey (Terminator: The Sarah Connor Chronicles), Emilia Clarke (Solo), Kit Harington (Spooks aka MI5), Nikolaj Coster-Waldau (Nightwatch), Charles Dance (Alien 3), and many others. What’s more, Game of Thrones isn’t afraid to throw you a surprise or two each season… sometimes several. This is truly a series where it feels like anything can happen… and that is a rare and wonderful thing indeed. Season One of Game of Thrones was shot digitally in 10-bit 4:4:4 at 1920x1080 resolution using ARRI Alexa cameras (save, I believe, for a bit of footage in the first episode that was actually shot on 35 mm film) but the captured image was recorded on HDCAM SR videotape. The entire season was produced on a tape-based workflow, with color correction done on set. This source was upsampled to 4K, given high dynamic range grades in both HDR10 and Dolby Vision, and is presented here in the original 1.78:1 broadcast aspect ratio. I have to say, I’m really kind of shocked at how good this looks. Given that the recorded resolution in 1080p is about a quarter of what native 4K would be (2160p, counting both axes), I wasn’t expecting to see any improvement in detail in this image at all. But HDCAM SR has an HQ recording mode that provides an 880 Mbps video data rate with low compression. The detail visible in this Ultra HD image is improved a bit; it’s rock solid, tighter-looking, and much less noisy than the previous Blu-ray presentation. This suggests to me that, for the first time at home, we’re seeing the full benefits of that higher data throughput in the production source. A few shots here and there appear a little optically soft, but in general the overall detail is very good – not native 4K good, but still impressive as hell all things considered. 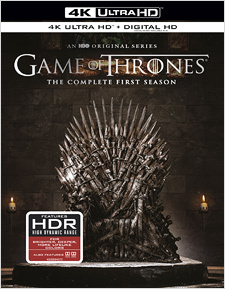 Also, because the image was captured in 10-bit, and Ultra HD presents that bit depth fully (standard Blu-ray is 8-bit), gone are the banding artifacts that were visible in the BD image (you notice this almost immediately after the opening credits in the first episode, as the banner-men from Winterfell capture the deserter from the Night’s Watch – as they ride over the hill the banding visible in the sky in that scene is now gone). The HDR grade here is restrained, as you’d expect given the source, but it does improve upon the previous Blu-ray noticeably. Colors are a bit richer and more nuanced, blacks are a bit darker. The Blu-ray looks brighter overall, but the expanded range of contrast in 4K definitely results in a more naturalistic image. The overcast sky in the North is now bolder, with a more realistic glow, while the opening sequence of the first episode (set beyond the Wall) is more gloomy and ominous. The highlights don’t pop as they do in some other 4K titles, but everything is at once more subtle and natural. I have to say, I’m really impressed with this image, a lot more than I expected to be. The differences are subtle, but they’re there and the more you watch the more drawn in you’ll be by them. I’ve given this image a A- grade and I think it genuinely deserves that, dinged only for its original capture resolution. And keep in mind, future seasons should only get better looking as the show’s capture resolution increases. Sound on the 4K disc is included in English Dolby Atmos (TrueHD 7.1 compatible) and it’s the same Atmos mix that was offered on the 2015 Blu-ray re-issue of Season One. It’s every bit as good now as it was then. Right away, when you start listening in comparison to the Blu-ray, you notice a richer and more enveloping soundfield. The gates of Castle Black roll up vertically into the height channels in the very opening shot of the first episode, and the metallic hoops of the orrery in the opening credits have a wonderful metallic scrape as they rotate and spin. There’s nice detail in the mix; lots of little sound cues move around the soundstage with a precision that’s just not there in the previous DTS-HD mix on Blu-ray. The DTS-HD mix was also a bit more biased to the forward portions of the soundstage, but the Atmos sounds smoother and is a bit more immersive. Dialogue is clear and clean, and Ramin Djawadi’s iconic theme and lush compositions have fine clarity and fidelity. Additional audio options on the 4K discs include English, French, Castilian Spanish, German, and Italian 5.1 Dolby Digital, Spanish 2.0 Dolby Digital, Russian 5.1 DTS, and Brazilian Portuguese, Czech, Hungarian, and Polish Voice-Over in 2.0 DTS. Available subtitles include English SDH, French, Spanish, Castilian Spanish, German, Italian (for the hearing impaired), Brazilian Portuguese, Czech, Hungarian, Polish, Russian, Dutch, Danish, Finnish, Norwegian, Swedish, Croatian, Greek, Hebrew, Portuguese, Romanian, Slovenian, Turkish, Chinese, Korean, and Thai. Note that the In-Episode Guide feature from the Blu-ray release isn’t here, so you may wish to keep your Blu-ray copies if you want to retain it. Most of the Complete Guide to Westeros content is here, thankfully, save for the Lands maps and descriptive text. The Hidden Dragon Eggs are here too, just not hidden anymore – they’re the Cast Auditions segments. You also get a Digital Copy code on a paper insert for the full season. It would have been nice if HBO had included the previous retail exclusive featurettes here too (Target, HBO Shop, and Walmart each had their own exclusives featurette for this season) but they’re not here. Still, it’s a decent batch of material. Game of Thrones is great television drama. It’s a series I actually resisted taking up until the original Season One Blu-ray release… and then I ended up watching all ten episodes in a single sitting I was so drawn in. And against all odds, this first season is also quite a good 4K Ultra HD release. This is absolutely the best these episodes have ever looked, better than broadcast, better than Blu-ray, and better than it damn well should look upsampled to 4K. If you’re a fan of the show and you’ve made the leap to Ultra HD, I can genuinely recommend this as a worthy upgrade. Get a great sale price if you must, but give the show a try in UHD. I think you’ll be surprised.